Welcome to the Endurance Nation Race Strategy page for Ironman® Boulder! Our goal here is to get you 100% up to speed and ready to have your best race possible. Every single race is unique, and Ironman® Boulder is no exception. Please review these resources and Boulder insights to prepare for your big race! Don’t have time time to dive into a full review of the course? Then cover the most important highlights in this short video with Coach Rich from Endurance Nation. Finally, be sure to watch Coach Rich’s Ironman Boulder bike course overview below, where he delivers valuable guidance for racing at altitude. Temperatures are generally mild for Boulder in June, though it may be chilly at the start of the race and winds are sure to pick up on the bike. And high altitude areas cool down quickly after sunset so be prepared for that as well. The Swim: Bring everything you need. Tinted goggles also recommended. The Bike: We recommend a triathlon bike with all of your aero wizardry applied: front race wheel, rear disk (or wheelcover), aero helmet, race tires, smart bottle and equipment placement, etc. For gearing we nearly always recommend a compact crank (50/34) or “super compact” (52/36) if you’re a bit of a stronger rider on an 11 speed bike. Everyone should have at least a 25t cog on their cassette, with less strong riders always benefiting from a 28t or higher (for example, a 28-12 cassette). The Run: You will want to choose gear that will give you flexibility to handle the heat, if a hot day is in the cards. It will need to have pockets for carrying nutrition, and plenty of zippers so you can reduce any accumulated heat. A hat is recommended, of visor at a minimum. 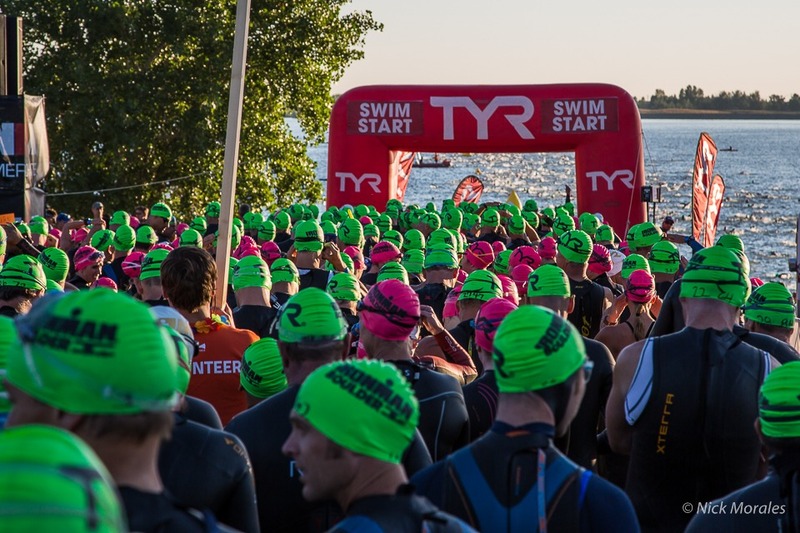 The Ironman® Boulder swim is a single loop, and you will not be swimming into the sun at any portion of the course. You will seed yourself in the chute according to your projected swim time. Bring a wetsuit, as well as a neoprene hat and perhaps booties, as you can expect the water to be cold in early June. The Ironman® Boulder bike is three loops, as one loop to the east that you do once before heading north and doing the “main loop” twice. The terrain varies from flat to rolling so be sure to learn how to ride hills smoothly and efficiently. Review Coach Rich’s Three Bullets video above for our complete hill climbing guidance, and be sure to watch his detailed bike overview video below. Ride very easy, ignoring everyone around you, until about mile 15 or 20 of the bike. The Ironman® Boulder run course is two loops with 3 out and backs on each loop. Be prepared for a climb from miles 20 through 24!